Although education researchers have drawn on the work of a wide diversity of theorists, a number of these have been of particular significance to education. While the likes of Karl Marx, Antonio Gramsci, John Dewey and Paulo Freire influenced previous generations of educational theorists, much of the more contemporary theory building has revolved around a quartet of well-known and much-debated thinkers – Michel Foucault, Jürgen Habermas, Pierre Bourdieu and Jacques Derrida. However, while the influence of these thinkers has grown considerably over the last number of years, both their original work and its application to education can prove challenging to the educational practitioner. The challenges they pose to educators are exacerbated by a lack of suitable reading material that can appeal to the advanced practitioner market, while also providing a sufficiently in-depth overview of the various theories and their applications in educational research. 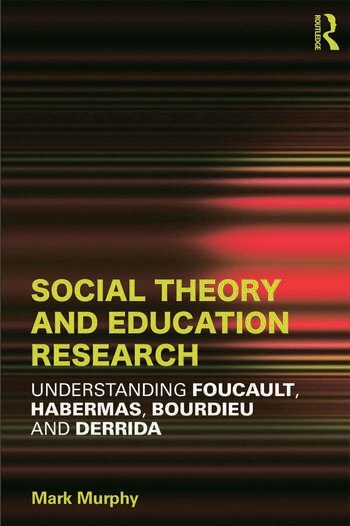 This edited book expertly rectifies this omission in the educational literature, and delivers a text that is both advanced and accessible, offering the education practitioner/researcher a suitable guide to assist their acquisition and application of social theory. The chapters included in this collection are designed to illustrate the diverse ways in which continental theory of whatever stripe can be applied to educational issues. From school surveillance to curriculum, social theory is used to shed light on ‘practical’ issues facing the sector, helping to widen and deepen discussion around these areas when they are in danger of being over-simplified. This book will be incredibly useful to post-graduate student teachers who wish to develop their capacity to engage with these debates at an advanced level. It will also prove of great interest to anyone involved in education policy and theory. Mark Murphy is Reader in Education at the University of Glasgow, UK. He is the creator of www.socialtheoryapplied.com, a website designed to provide a platform for discussion around the relationship between theory and educational research.